Caramel Corn is one of our favorite things to make in the Fall. Remember I made it last year for Jack's preschool party? This is SUCH a great treat. It makes quite a bit so you can share some with others. Jack and I made this batch together and had enough for us, and to fill two tall jars to give as gifts. I know I have posted this before but it has been a year and it is worth sharing again. The key to good caramel corn is good popcorn (do not use microwave popcorn!). We used our Whirley Popper to make the popcorn. Preheat oven to 250 degrees. 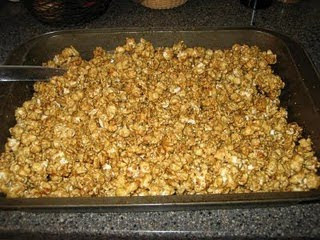 Generously butter (or spray with non-stick cooking spray) a large roasting pan and put popcorn in pan. Bake at 250 degrees for 1 hour, stirring every 15 minutes. Cool and store in tightly covered containers. This also freezes well. This was a great gift for Papa and for our good friend Mrs. K for their birthdays. I love how nice the jars looked with the fall ribbon tied in a bow around it. The jar on the right was our snacking jar...and it didn't last long! Recipe from my mom's good friend, Barb Halliday.